The course was established in 2003 as the OII’s first foray into teaching, and was intended to help us think about where we could add value in developing our own graduate degree programmes, as well as providing an early opportunity for our faculty to teach. Whilst we initially thought the programme would end once our own degree programmes were in place, it quickly became clear that the course is highly valued by SDP participants, and we continue to receive far more applications than we have spaces available. It remains one of the highlights of the OII academic year and we are proud to have worked with the hundreds of wonderful alumni who have passed through the programme, many now in tenure-track positions as field-leading academics. Each year SDP follows a tried-and-tested format offering students two daily seminars on the latest research issues presented by leading faculty, with plenty of time allocated for discussion and questions. Over the course of the two weeks, all students will also have a chance to present their research to their peers in informal seminars, with a view to gaining personal feedback on their dissertations. In addition, there will be optional classes focusing on particular tools or methods likely to be of use to subsets of the larger group as well as sessions focusing on career issues such as publication strategy or job applications. The programme will facilitate deep discussion of both substantive and methodological research issues, help students frame and reassess their research questions and direct their research. We also aim to generate productive dialogue and debate between students from different disciplinary backgrounds on issues relating to the study of digital technologies, with a view to identifying topics for future collaborative research. To apply, please download and complete the 2019 Application Form and return it to us by emailing it to us in a single email with all relevant attachments, to sdp@oii.ox.ac.uk. All applications must be received by 12pm (GMT) on Monday 18 February 2019. Successful applicants will be notified by 5pm (GMT) on Friday 29 March 2019. 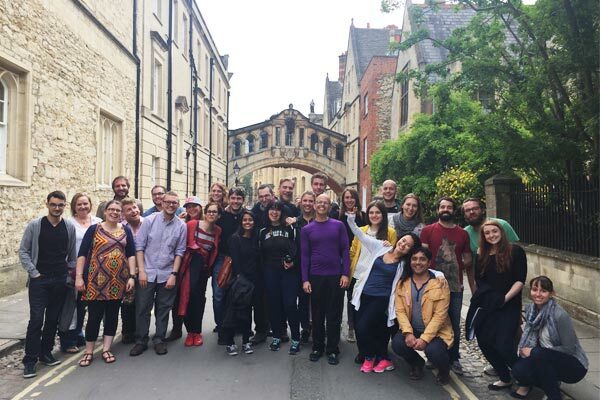 The cost of the course is £1875 which covers accommodation at Hertford College, from 30 June-12 July, and all course tuition fees. Travel to and from Oxford is not included in this fee. Lunch will be provided on week days, and several dinners and social events are also included. The OII offers one SDP scholarship equivalent to the cost of the SDP fee. All applicants will be considered automatically and need not submit any additional information. SDP 2005: Students oustide Hertford Bridge, often called “the Bridge of Sighs”a skyway joining two parts of Hertford College over New College Lane in Oxford. In the words of a past SDP student: “Be honest about your research. Think about the strengths of your PhD: what’s the gap in the literature that you want to fill and how are you going to achieve this? Remember that your readers might not be familiar with your theoretical background so be clear and concise in addressing the literature. Don’t forget to justify your methods and what you expect to find. If some things are still unclear about your research, that’s normal. Don’t be shy in articulating your expectations from SDP. You won’t find all the answers there but lots of useful hints and advice that will help you keep going. SDP students come from a wide variety of disciplinary and methodological traditions; what they all share is a genuine intellectual curiosity and a willingness to consider these different perspectives. 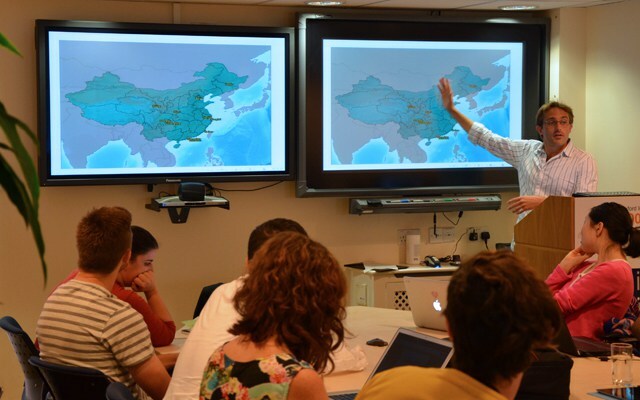 OII Fellow Joss Wright (SDP2012) presents recent work on mapping internet censorship. Can’t find an answer to a question? Then ask us a question and we will get back to you. Please also visit the SDP Student Voices page for SDP Alumni blogs for information about the programme from past participants. The OII’s research covers a vast range of topics and disciplines: law, economics, politics, digital humanities, etc etc. How do I know if I will fit into the mix? The most fundamental requirement is that our SDP students must be writing a thesis or dissertation about some aspect of life with the Internet. Beyond that, it’s the place to be if you have an open-minded approach to how best to study the Internet. Our typical cohort includes students from a wide variety of disciplinary and methodological traditions, and what they all share is a genuine intellectual curiosity and a willingness to consider these different perspectives. How much am I expected to know (or care) about other disciplines? What is the benefit of (for example) a law student, or economist engaging with people and ideas from outside their own discipline? The simple answer is that you’re *not* expected to know about other disciplines, but you are expected to be interested in their possible contribution to your research field. One of the perks of running SDP is seeing all the water-cooler conversations striking up outside the formal seminars. So, for example, we’ve previously taken students focused on online privacy, some studying it from a sociological perspective, others from a regulatory one. Each may have knowledge of a common core of literature, but can still learn from the other’s expertise. Or in another case, students may not share a common disciplinary or even topic approach but could have similar interests in applying a particular method. In each case, there has to be a basic willingness to step back from your own work and see how others might understand it. Are any disciplines (or research methods) favoured over others when you review the applications? Do you accept candidates who study the Internet from outside the social sciences (eg the sciences and humanities)? Yes, we certainly do, but with the proviso that most of our teaching will draw on social science theories and methods. Do I have to study ‘the Internet’, or could my thesis research involve other ICTs? We interpret the Internet in a very broad way, as a ‘network of networks’ that incorporates the use of many ICTs. We do have faculty who have focused specifically on the use of particular technologies e.g. mobile phones, or grid computing, but in each case, the interest stems from the fact that they are ‘wired’. I’m not a techie! Is that a problem? Possibly a bonus if you want to engage in some of the SDP conversations about building your own data-scraping tools, but it’s certainly not required. Should I have a clear idea / plan of what I want to get out of the programme? Yes, this is really vital. First of all, the programme is going to cost you or your sponsor quite a bit of money and you have to be sure it’s worthwhile. But more importantly it will help to frame your application and your participation. For example, everyone who attends will benefit from the peer network established, but only those who have a genuine motivation to learn and a sense of their work’s weaknesses will be able to use the two weeks to really make progress on their thesis. When is the ideal point in my doctoral studies to apply to the programme? We usually say not too near the start of the first year, or end of the last so that there is a real opportunity to apply the lessons of the Programme. In American-style PhD programmes this means that you should apply when you have reached the dissertation stage. I haven’t decided a thesis title yet: is that a problem? You won’t be ruled out of the application process but we do often give priority to those who are more advanced in their study. If you don’t have a final title yet, at least give us a provisional one, and an indication of the likely area. I haven’t started on my data collection yet: is that a problem? If my application is not accepted, can I still apply for subsequent year/s? Absolutely! We always have more good applicants than we can accept, and sometimes an application is stronger when the applicant’s work becomes more advanced. The application deadline is 12pm (GMT) on Monday 18 February 2019. Successful applicants will be notified by Friday 29 March 2019.